In 1985, the Destination Wedding industry in the Cayman Islands was in its infancy. My father, Vernon Jackson OBE, JP, retired from a distinguished career in the Civil Service, and the Governor at that time, asked him if he would become a Marriage Officer as visitors to the island were looking to have beach weddings, and weddings at the various hotels and restaurants. 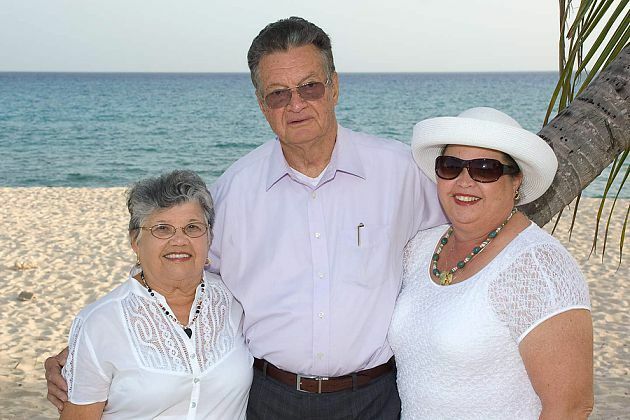 A couple of years later, Vernon was joined by his wife Francine, who in 1992 became the first Civil Registrar of Marriages in the Cayman Islands. Their business, Cayman Weddings was to become the first true wedding services business in the Cayman Islands, and for the next 30 years my parents between them, officiated at more than 8000 weddings, and scores of Wedding Vow Renewal ceremonies. Ten years later, in 1995 I became my mother’s Deputy, sharing her Marriage Register and conducting weddings when she was off island. My parents have become legends in the wedding business, and I guess you can say I learned from the best. When I retired from government in 2005 I still helped my mother in her office in West Bay, and officiated the occasional wedding but I soon realized that if Cayman Weddings was to grow we needed to get back into the cruise wedding business as well as the tourist and local weddings business. I received my full license as a Marriage Officer in 2007, and in 2008 I opened my own business in George Town, specializing in cruise weddings. Being near the cruise landing in our beautiful facilities on North Church Street, overlooking the harbour is an ideal spot for Simply Weddings. We have a Bride’s Room where our brides can get dressed, and have other services such as hair & makeup. We have a wedding room where simple, private weddings can take place, because not every bride wants to be married on the beach, particularly during the summer. As a Civil Registrar of Marriages, I run a very busy office, so busy that in 2011 my husband, Sam Basdeo joined me and now handles all the applications, and scheduling while I handle the planning and the ceremony. In about 6 weeks time I will officiate my 2000th wedding, definitely cause for celebration. Sam and I love what we do, and it shows. Our motto is “Simple, elegant, and personalized” and we live this every day. It also helps that we have been married for 45 years this year, so you could say we walk the talk where marriage is concerned. Sadly, my dad passed away in October 2016, but every time I use my favourite ceremony which was written by him, I can remember him saying “We are gathered here, where the sun meets the sky, the sky meets the water, and the water meets the land…” it brings back happy memories of him, My mother is still performing weddings, and often fills in for me when Sam and I are traveling, and still does many ceremonies at her wedding gazebo in the town of West Bay. When they were teenagers, the Basdeo children all helped out with weddings and they have grown up in the wedding business. I look forward to one day being able to hand over this legacy Caymanian business to one of our children or grandchildren.